You probably don't want users in your organization to notice when security and other updates are applied to Office 365 ProPlus on their computers. In most cases, they won't notice as the updates are installed automatically in the background. But, you should be aware that there are times when users see notifications that updates are available or need to be applied. Updates can only be applied when Office programs aren't running. Therefore, notifications usually appear because the user is working in an Office program, such as Microsoft Outlook, and hasn't closed it in several days. After updates are downloaded to the computer that is running Office 365 ProPlus, Office attempts to apply the updates. If, after four days, the updates still aren't applied, a message appears in the notification area in Windows, telling the user that updates are available. The message disappears in a few seconds, but the Office icon stays visible in the notification area. 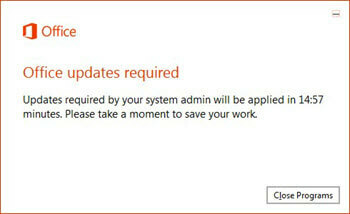 If the user clicks the message, Office tries to apply the updates. If any Office programs are currently being used, they must be closed. 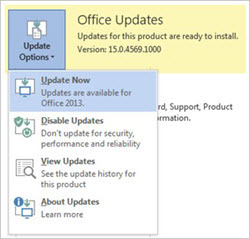 If, after six days, the updates still aren't applied, a message appears in any newly opened Office document, reminding the user that updates are available. Users can choose Update now to apply the updates. The user is then prompted to close all open Office programs. After the updates are applied, the message disappears. Users also see notifications if they go to File > Account in an Office program. The Office Updates section turns yellow if updates are ready to be applied. If you don't want your users to see these types of notifications, you can use Group Policy to hide the notifications. To make sure that your users apply updates to Office 365 ProPlus, you can configure a deadline. The deadline specifies a date and time by when the updates must be applied. If the updates aren't applied by the deadline, Office automatically closes any open Office programs and applies the updates. Users are given notifications leading up to the deadline. For example, within seventy-two hours of the deadline, users see a message, in any newly opened Office document, that updates are blocked. The next reminder users see is twelve hours before the deadline. They'll see a message in the notification area in Windows, reminding them that updates are ready to be applied. This message appears every two hours. It'll also be shown 60 minutes, 30 minutes, 15 minutes, and 5 minutes before the deadline. If the deadline arrives and the updates still aren't applied, users see a dialog box that warns them that they have 15 minutes before the updates are applied. This gives users fifteen minutes to save and close any work. When the countdown reaches 00:00, any open Office programs are closed, and the updates are applied. The Hide update notifications Group Policy setting doesn't hide notifications related to deadlines.